Several years ago, I described a podcast as a radio show that’s delivered to your iPod. That is still an acceptable definition, only the number of devices that can receive the show has grown. Computers, smartphones, some car stereos, Internet radios, and more all grab podcasts for you. As the format’s popularity has increased, the technology behind it became simpler to use. Today, people around the world produce and share podcasts on all manner of styles and topics. The more shows you subscribe to, the greater the need for good software to keep it all organized. In this post, I’ll discuss two solutions for mobile devices: one for the iPhone and one for Android. There are several others, of course, but these are two standouts to help you get started. I use Apple’s own Podcasts app on my iPhone. It ships with the iPhone, is free, and is easy to use. When Podcasts was introduced in June of 2012, it was divisive to say the least. Apple was in a playful design phase back then, which manifested itself in the Podcasts app with an animated reel-to-reel tape player that was supposedly inspired by a real unit from Braun. (Sure.) Many fans liked it, and many did not. About a year later, Apple nixed the design, and today we have a nice, clean presentation. The aesthetic shift was accompanied by additional features that are still in place today. Apple provides three ways to find shows you’ll like — they are Features, Top Charts and Search. Features. Tap the star icon at the bottom of the screen to browse the podcasts that Apple has deemed worth showing off. Purple buttons at the top of the screen let you view just audio shows, just video shows, or the whole lot at once. A “New and Noteworthy” section is a grab-bag of shows that are performing well in iTunes. Beyond that, you’ll find shows that fit in rotating themes. As of this writing, Apple is highlighting the great outdoors and the financial markets, as well as featured providers like Slate, Nerdist and Revision3. Finally, you can tap Categories in the upper left to fine-tune your search. Top Charts. Here you’ll find the most downloaded shows in each category. Again, you can opt to see audio video podcasts. Search Finally, you can cut to the chase and search for the name of the show you’re seeking. Podcasts lists show titles and episodes that mention your search term. Once you’ve found a show you’re interested in, tap the Subscribe button. Podcasts will download the latest episode for you. Note that you’ll see two buttons once you tap on a show’s image: My Episodes and Feed. My Episodes lists the episode(s) that have been downloaded to your device. Feed lists the show’s archive of older episodes, which are not on your device. You can download any of these older shows by tapping the cloud icon to the right of its title. Apple makes it easy to keep things organized. To begin with, you can choose between a list view, which shows a small thumbnail of each show’s art, its title, the date of the most recent download, and the number of episodes available. Meanwhile, the album view eschews all that information and instead shows big, bold cover art and a number representing the episodes you haven’t heard. Tap the Edit button in the upper right. A three-lined “handle” appears next to each show’s title. Tap and hold on that handle, then drag the shows into your preferred order. Finally, you can create what the app calls Stations. Essentially this is like a playlist in a music app. Simply start a new station by tapping Stations at the bottom of the screen and add any shows you like. I have a sci-fi station and an audio drama station. As each episode is played through, it disappears from the station. New ones are added automatically. This saves a lot of scrolling if you have a many subscriptions. On the Android side, I recommend Pocket Casts. This great-looking app is easy to use and, like Apple’s Podcasts, offers nice options for keeping things organized. ShiftyJelly recently released version 4.0 with a great-looking new user interface. Unlike Apple’s offering, which puts buttons at the bottom of the screen, Pocket Casts has all controls “behind” the main screen, so your shows are front-and-center. It’s a clean look that I appreciate. To find shows, swipe finger to the right to move the main screen and reveal the controls. Again, Shifty Jelly’s developers did a good job here because the controls are clear and legible. At the top of the screen you’ll see the Discover button. Tap it to view featured shows. Tap any title to get a description and the option to subscribe. The search works great, too. Just enter a keyword or name of a show and you’re presented with several options. Downloaded episodes are presented in a list with the title and description. There’s a playlist option, too, similar to Podcasts. 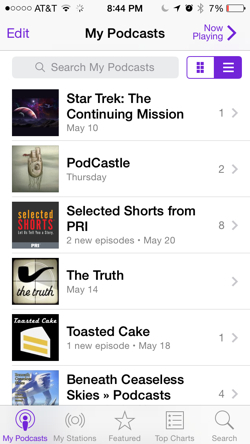 You can view a list of just unplayed episodes across all of your shows, audio podcasts, or video podcasts. It’s true that you can obtain, listen to, and organize podcasts with a computer. I happen to listen to podcasts almost exclusively while I’m in the car, and that means I’m using my smartphone. Many developers recognize this trend and build strong organization features into their mobile apps. The fact that I can arrange things to my liking on my phone without having to sync or otherwise communicate with my laptop is a huge benefit. 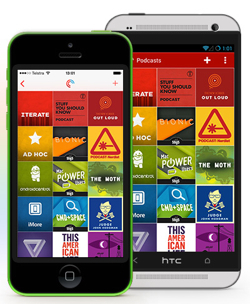 Picking a podcasting app is a personal thing. As I said, there are many worthy options out there. If you have a favorite, let me know. I’m always willing to try something new if it might be better than what I’m already using. Today, our parent company launched an exciting Kickstarter campaign for an online platform for music education, practice, and collaboration. It’s called MusicFol.io and it’s designed to help people keep all aspects of their musical lives organized. There’s a second video on the Kickstarter page that shows a detailed demo of how the site will work. If you think you might find this useful, please consider backing the project. And please share it with any music students, teachers or performers you know who could benefit from a suite of online organization and collaboration tools like this. Although super cute, I do have a number of logistical concerns about this product. My biggest problem is that it’s not sealable. When not in use, moisture and air can get in and degrade your sprinkles (or jimmies, if you’re from the small part of the US that uses that term). Small bugs and dust can also get into the container and contaminate your sugary confection. A storage container for candy that doesn’t seal when not in use is a really bad idea. Looking at the second image above, it appears the unicorn’s derriere has atrocious accuracy. There are wasted sprinkles strewn all over that table top. Wasted sprinkles?! Shame on you, Unicorn Sprinkles Shaker! Shame. On. You. Next, you can’t see the sprinkles in the unicorn’s guts and legs to know how many sprinkles you have left or what kind you’re going to get before you shake the unicorn’s backside over your cupcake or ice cream sundae. No one wants to be surprised by the wrong type of sprinkles (and the wrong ones are obviously the hard, solid sugar ones with no chocolate — the chocolate makes them yummylicious). 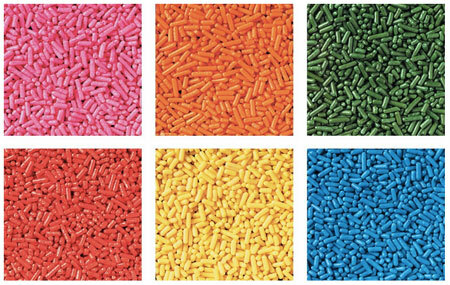 In our house, we have one container with six sorted colors of sprinkles — red, yellow, blue, green, pink, and orange — because sometimes my son only wants green and on KU game days I only want red and blue. And, there is no way I’m going to stand and sort out all the single colors of sprinkles from the herd. (All the single sprinkles, all the single sprinkles.) 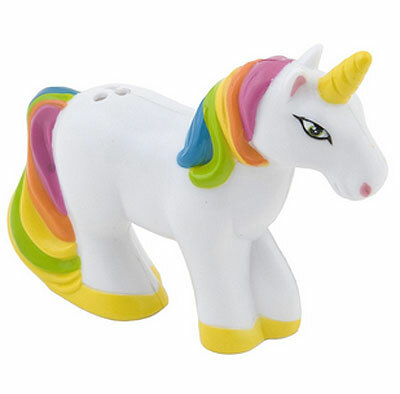 To meet our needs, we would need six Unicorn Sprinkles Shakers, one for each color, and that is simply ridiculous. 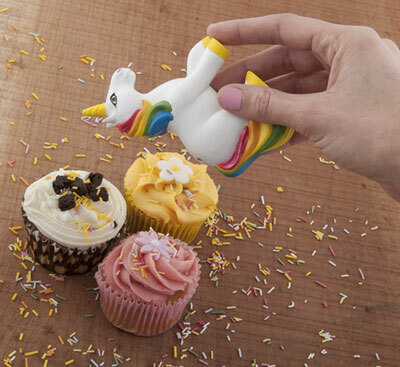 Oh, Unicorn Sprinkles Shaker, you’re adorable but wholly unhelpful and would quickly become clutter in a kitchen cupboard. Spending too many hours at work? Being a workaholic could hurt your productivity. If you’re trying to be an environmentally conscious unclutterer, you probably know that reuse is preferable to recycling. If someone can enjoy the paperback book I’m getting rid of, giving the book to that person (directly, or through a venue such as a used bookstore) is better than tossing the book into my recycling bin. But, sometimes the recycling bin is the right answer. If the book is falling apart or it’s a reference book that’s now seriously outdated, it’s ready to be recycled. Pantyhose: No Nonsense recycles tights, pantyhose, and knee-highs of any brand; these can be turned into park benches, vehicle insulation, playground equipment, toys, and more. You will have to pay the shipping cost yourself, though. Styrofoam blocks: Styrofoam is actually a trademark of the Dow Chemical Company; most of what we casually refer to as Styrofoam is not actually Styrofoam, but expanded polystyrene (EPS) foam: the rigid foam often used in packaging. This EPS foam can be hard to recycle, but if you live in the San Francisco Bay Area, you can recycle it at GreenCitizen, for $5 per 30-gallon plastic bag. Waste to Waves lists other places in California that accept EPS foam that gets turned into new products, including surfboard blanks. There are programs in other parts of the country, too. If you’re looking for recycling options in your area, you might check out the EPS Industry Alliance website. Or go to Earth911, and search for #6 Plastic (Polystyrene). If you find a recycler, be sure to call and confirm whether or not the service takes EPS foam blocks before driving to their facility. Nespresso capsules: Nespresso has a recycling program for their coffee capsules. You can either drop them off at numerous collection points or mail them to a provided address. Cosmetics packaging: If you use Origins cosmetics, you can recycle the containers at their store. As the company says: “Starting March 29, 2009, Origins introduced a program in North America that encouraged its customers to bring their empty previously unrecyclable cosmetic tubes, bottles and jars, etc. — regardless of brand — to their nearest Origins retail store or department store counters. All returned packaging is sent back to a central location where products will be recycled or used for energy recovery.” M•A•C Cosmetics, Kiehl’s, Aveda, and others also have packaging recycling program, and some of them reward you with samples or discounts when you recycle their containers. Even more: TerraCycle has its Brigades, where you sign up to recycle a specific type of item, such as Brita filters, energy bar wrappers, drink pouches, or cheese packaging. You collect your specific item and then mail the collected items in, postage paid (in most cases). All of these recycling alternatives are more cumbersome than curbside recycling, and not everyone will choose to take advantage of all (or any) of them; we each need to make our own decisions about what we do. Sometimes, it’s all we can do to simply get the items out of the house; recycling just isn’t going to happen. Even ongoing recyclers may have moments when they decide to skip it, just for once. As the process becomes increasingly easy, more of us will decide it’s worth the small extra effort to recycle items as we unclutter our possessions. A while ago, I discussed five common organizing myths in a post on Unclutterer. Since then, I’ve come upon two more myths that you should watch out for when tackling the clutter in your home. This [insert product or system here] will solve all of your organizing dilemmas. There are as many organizing products and systems as there are people who wish to be organized. Think carefully about your lifestyle and your preferences before you invest in specific products or systems. This organizing system works perfectly now so it will work perfectly forever. Even small changes such as your municipality changing your trash pick-up day may require you to alter your organizing system. A food company’s decision to change the package size of your favourite cereal box might require you to re-organize your kitchen cupboards for greater efficiency. Whenever your system becomes cumbersome or ineffective, re-evaluate and make adjustments. If you think you might have fallen for one or both of these myths, consider what steps you can take to get things back on track. This week’s unitasker selection is a very disturbing device that cooks eggs into a cylinder and then extrudes them into the air. It’s … special. Art and craft supplies: In San Francisco, we have SCRAP, which “collects donations of quality, clean, reusable materials such as fabric, paper, arts and crafts supplies, wood, beads, buttons, and so much more and makes these materials available as supplies for teachers, non-profits, parents, artists, and students.” RAFT in San Jose does something similar, with an emphasis on serving teachers. In New York, there’s Materials for the Arts. In Chicago, there’s Creative Pitch. There’s a second SCRAP in Portland, Oregon. There’s also the Pittsburg Center for Creative Reuse and the East Bay Depot for Creative Reuse (in Oakland, California). A Google search can help you find if there is a similar program in your area. Binoculars, birding field guides, digital cameras and more: Birders’ Exchange collects these supplies and sends them to “researchers, educators, and conservationists in Latin America and the Caribbean working to protect birds and their habitats” who lack these basic supplies. Fur coats: Each year, Buffalo Exchange runs a Coats for Cubs fur drive; the coats are disassembled and shipped to animal rehabilitation centers to serve as bedding. The 2014 drive has ended, but the Humane Society of the United States suggests you contact wildlife rehabilitators in your area to see if they can use the coats. There is also Born Free USA’s “Fur for the Animals” drive, which runs until June 30 this year. However, there are only a couple drop-off points for this program. Gloves: Glove Love is “a matchmaking service for single gloves who have become separated from their partners.” Sadly, it’s in the U.K., or I would have a lot of donations to send in! Musical instruments: Various organizations around the country collect instruments for those who can’t afford them. The Mr. Holland’s Opus Foundation accepts donations of gently used band and orchestral instruments in playable and good cosmetic condition; they need to be shipped to the foundation, in California. The instruments get refurbished, and sent to programs throughout the U.S. The LINKS program — Lonely Instruments for Needy Kids — does something similar specifically for those in the greater Cincinnati area. The Carroll County Arts Council in Maryland has a Musical Instrument Bank. There are other local programs, too, so you can look for one near you. Pet care supplies: From blankets and towels to pet toys to litter boxes, your local humane society or other animal shelter can probably use it all. Yoga mats: Various yoga charities — groups that run after-school programs, work with children on the autism spectrum, etc. — can use the yoga mats you no longer need. This device is crazy scary. 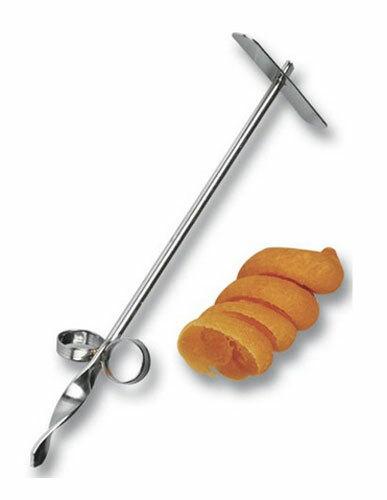 I know it says it’s for ribbon curling carrots, but that is not what it looks like it is used for. This thing is a weapon! How is it even sold on Amazon?! If my parents would have had one of these growing up, I never would have gone into the kitchen. It’s terrifying. MAYBE a fancy restaurant would have need for something like this, but they would need to keep it under lock and key for obvious reasons. This may just be the scariest looking unitasker we’ve ever featured. Whatever you do, don’t let any kids see this post. Gah! Erin is one of 20 contributors to Manage Your Day-to-Day: Build Your Routine, Find Your Focus and Sharpen Your Creative Mind, the first book in a three-part series exploring creative productivity, time management, individually tailored processes, and great design. About two years ago, I got into board games in a serious way. This hobby creates hours of fun and huge storage needs for me. I recently wrote about keeping board games stored and organized, and today I’ll take a look at doing the same with collectible game cards. Like other hobbies and collections, if you’re going to pursue them, it can be a good idea to keep associated items organized and protected for ease of use, less mess, and longevity of the items. Similar principles apply to storing many items, so although this article is about collectible cards it is meant to inspire ideas about storing whatever it is you have decided to collect. Whether you’re into wax Mold-o-Rama figures like Erin or something else entirely, hopefully there are some insights here you can apply to your collections. A little background for those of you not into card games: there are a huge number of collectible card games in production. Game enthusiast website Board Game Geek lists 47 pages of game titles. Many cards are of a standard playing-card size, but you can find examples that are larger and smaller than a deck you use to play poker. For the sake of this article, I’ll focus on the most common size. There are three categories of cards: those you actively play with (like you would in a game of Bridge), those you don’t play with but are willing to trade (collectible card games often include trading), and valuable cards that are kept locked away (I’ll explain more about these below). I keep the cards I’m actively using in a single box. If the cards won’t fit in the box, I don’t bring them into the house (following the concept: a place for everything and everything in its place). My current game of choice is Magic: The Gathering. It requires players to build a custom deck to play against their opponents. After testing several brands and types, I like the Ultra Pro Satin Tower (pictured above). 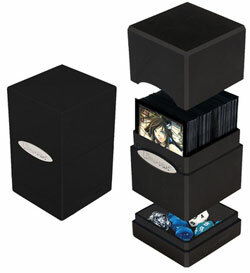 It holds up to 100 sleeves of cards (more on sleeves in a minute) and has an additional, snap-off compartment for holding dice, counters or other accouterment that the game requires. With the lid removed, your cards are easily accessible and it looks great. Plus, the lid fits snugly enough that you don’t have to worry about it accidentally opening up and making a mess. Putting your cards into sleeves is divisive. Casual players spend little on cards and just want the fun of competition and spending time with friends. But with resale value in mind, I’m somewhat more than a casual player. I definitely play the cards I buy, and I want them to look nice for as long as possible. To protect them, I put them in sleeves. The best sleeves I’ve found are from Demkar’s Dragon Shield. A big part of collectible card games is trading with friends. Binders are a great way to show off your collection and let a friend browse through it easily. This could apply to a number of hobbies and collections where sharing it with others is part of the fun of collecting. For cards specifically, there are several manufacturers out there, but I suggest you pick up one from Ultra Pro or Monster. The Ultra Pro sleeves can accommodate two cards (though I suggest putting one card per pocket) and it carries up to 360 sleeved cards in total. Additional pages can be purchased for about $0.20 each, and the piece of elastic that surrounds the cover ensures that your cards won’t fall out during storage or transport. Monster makes a smaller binder that has four pockets per sheet instead of nine. They’re much more portable and have a nice-looking matte finish cover (the Ultra Pro’s is shiny). The build quality is a bit better, and they’re more expensive. Whichever you use, remember that the sheets are not acid-free, so you want to first place your cards into acid-free sleeves, like the Dragon Shields. Whatever you’re collecting, try your best to store it in a way that doesn’t damage your collection. I realize it might seem silly to some to keep a playing card tucked away as an investment. I tend to play with the cards I buy. However, I also realize that there’s a real market for some of these items and that many people treat them as an investment. And, there are other types of collections beyond cards where people do buy items hoping to make money on their sale. The best advice I can give here comes from Mao Zedong: “The best defense is a good offense.” Meaning, take precautionary steps to protect your darlings. I recommend double-sleeving these cards, putting them into a lock-seal bag that’s as free of air as possible, and then placing that into a fireproof safe. Excessive? Yes. But, if you’ve got cards (or whatever it is you’re hoping to sell for profit) that are worth a significant amount of money, you’ve got good reason to protect them. The good news is that, with a little thought, you can enjoy your card games and keep them looking great for years to come. If decorative plates are your thing, don’t pile them up in a stack at the bottom of a closet where they can be broken — display them on your wall with secure plate hangers to organize, protect, and display them. If signed baseballs are what you collect, get a UV-protected glass display chest and show them off. Organize, protect, and share your collection so it’s obvious you value it and don’t think of it as clutter. If you want it in your life, take care of it. When thinking about organizing, you likely don’t consider it to be world changing or revolutionary. However, the history books would suggest differently. For example, there are two scientists who reorganized information and created organizational systems that allowed humans to make significant advancements in the fields of science and technology. Carl von Linnaeus (1707-1778) was not the first scientist to recognize that different species could be grouped together based on some common characteristics. However, until Linnaeus’s time, scientists arbitrarily gave the species they classified complicated Latin names that they changed whenever they wished, depending on what other species they were classifying at the time. This meant that two different scientists could be using different names for the exact same species. In 1735, Linnaeus published the revolutionary book Systema Naturae. It outlined his scheme for classifying all known and yet-to-be-discovered life forms. His system was simple to understand and apply, and it could be easily modified to accommodate changes and new developments. Linnaeus’s method of organization was accepted as the scientific standard by the early 1800s. In the early 1800s, scientists attempted to organize chemical elements by listing them in order of atomic mass, but that method didn’t adequately explain the relationships between the elements. And, scientists like Dmitri Mendeleev (1834-1907) realized that there was a recurring pattern relating the physical and chemical properties of elements to their atomic number — it wasn’t chaotic. In 1869, Mendeleev re-arranged the elements. He moved them from a list into a table. He placed the elements into horizontal rows in order of their atomic number and placed those with similar properties into vertical columns. 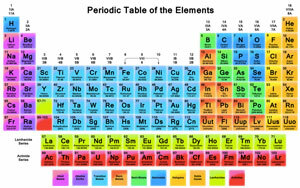 By organizing the elements in this way, Mendeleev allowed scientists to classify, systematize, and compare all the many different forms of chemical behaviour. In science classrooms all over the world, posters of his Periodic Table of the Elements hang on the wall. Organizing can change the world. And, although organizing your wardrobe or kitchen cupboards may not win you a Nobel Prize, it just may make your life a little easier.